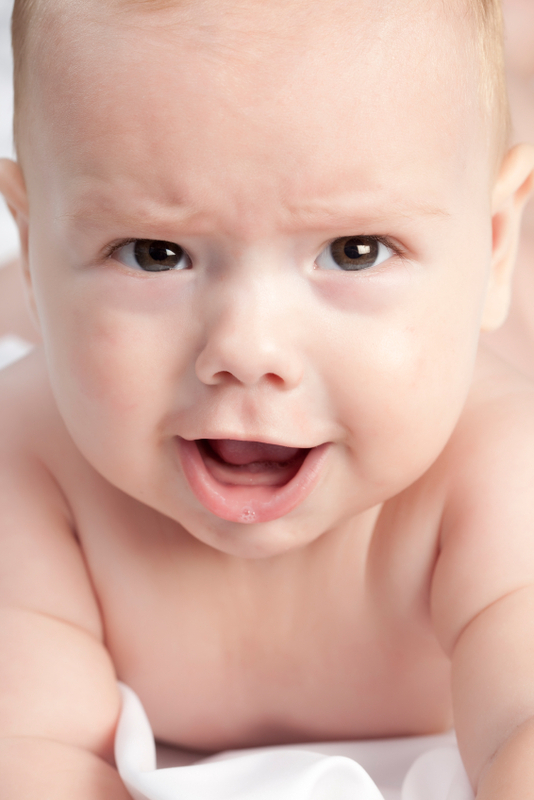 Reader Question: 7 month-old "yelling"
you do not respond, she gets louder and at times even shows an angered face. I am curious...Is this a negative behavior leaning towards fits or just her way of communicating? And how should I handle it. I feel if I respond to the yells, it is teaching her that yelling is appropriate to get things you want. But if I ignore her, how else is she going to communicate? A little confused. Even though this comment is referring to a post that is a few years old, it is very timely for me personally. My youngest daughter, Charlotte, is almost 5 months old and if I had to choose one word to describe her, it would be LOUD! She started cooing a few months ago and since then, she has gotten very comfortable with her own voice! She loves to “talk” to her older sister and “sing” to the dog. Most of the time her noises are happy, but there are times, like when the mobile stops before she’s ready, that her babbling turns to squealing, or as the reader called it, yelling! While I understand why the reader feels that her baby may be developing a bad habit, I don’t think she has reason to worry yet. The reader’s daughter is a little older than Charlotte, but they are both doing the same thing; they are experimenting with their vocal ability and learning from the response they get! Babies learn cause and effect at about 4-5 months of age, and with this new found understanding of the world around them, they also begin to show frustration. It seems that the reader’s daughter is showing her frustration by yelling, and for her age, that is perfectly normal; what other option does she have to express those feelings? The important thing to remember is that even though she is learning through trial and error at this stage, she is also learning by watching people around her. Ignoring her when she is yelling won’t do anything to ease her frustration, but responding quickly and acknowledging her feelings will teach her that you are there for her and want to help her understand her world. Even though she isn’t communicating with actual words yet, she does understand a lot of what is said. Her language skills are developing and talking to her will help her learn to communicate more effectively. She will also learn to deal with her feelings by watching how others react to theirs, so modeling the appropriate way to express emotions is very important. We hope we’ve answered this reader’s question, and we welcome you to ask questions too! Simply post a comment to any of our blog posts and we will do the research and find an answer for you. Last time, we posted the answers to the most common questions mothers had during the first 3 days postpartum (click here for information about wound care, returning to your prenatal figure, and infant feeding). As we noted in the first post in this series, the featured study showed that many of the inquiries moms have during the first 3 days and beyond are very similar, so in today's post we’ll answer the most common concerns of mothers in their babies’ first month. Baby Behavior topped the list of concerns after the first 3 days postpartum. To brush up on your knowledge of normal infant behavior, read our Basics of Baby Behavior series about understanding infant sleep, cues and crying. Newborn behavior can be quite different from that of older babies and can be unpredictable and erratic at times. For specifics about normal newborn behavior, click here. Understanding their babies' behavior makes parents feel more confident that they know what to expect. Mothers concerns related to development centered mostly on wanting to know what was normal. 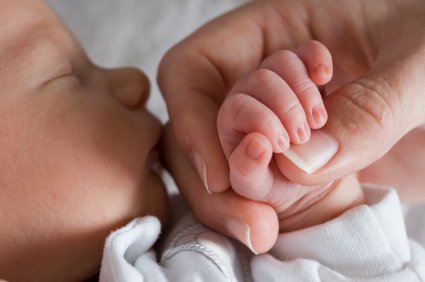 In a previous post, we explained how reflexes rule when it comes to newborn development. By 2-4 weeks of age, your baby’s development reaches a whole new level as she becomes more aware of the world around her. One of the most common questions, even among mothers who had multiple children, was about how to be a “good” mom. This is a tough one; obviously there is not one right answer for this question. However, we definitely recognize the overwhelming responsibility that mothers feel to take care of everything and everyone in the household. The best thing you can do for your new baby is to take time to care for yourself physically and emotionally and to connect with your baby. Remember, that special language you will develop with your baby takes practice, but responding to your babies needs will help you develop a relationship of trust and understanding. That sounds like the foundation of “good” parenting to me! To explore study findings about new motherhood, click here. If caring for a newborn baby in itself wasn’t a full-time job, try factoring in caring for other children, your spouse, household chores, and (don’t forget) yourself! We think that learning the art of asking for help, when you need it, can be an important tool. Remember to be realistic and proactive when asking for help and realize you are not alone. Keep in mind the old adage: It “takes a village” to raise a child, and pick up the phone. It's not surprising that adding a new sibling into the mix is not only a big concern for parents but also for the siblings themselves. In an earlier post, we talked about the best way to introduce siblings to "their" new baby. Every child will react differently, but most children respond well to advanced preparation and like to know exactly what to expect when the new addition arrives. Remember that your family is adjusting to the new baby just as much as your new baby is adjusting to you! If you have any other questions or concerns you would like to have known about during your first month postpartum – we would love to hear from you! In our previous post, we shared a study reporting postpartum mothers’ most common concerns in the first days and weeks postpartum. Their questions varied from concerns about their own post-operative care to those about feeding and caring for their infant. In today’s post, we’ll provide some answers to mothers’ most common questions about the first 3 days postpartum. For more detailed information on any of the topics below, please see the reference section at the end of this post. Whether you’ve had a C-Section or an episiotomy, it’s important to know what to expect from the procedure itself and how to care for the stitches and wounds afterwards. It’s important to breastfeed in a position that is most comfortable for you and doesn’t put pressure on your incision. Wound care of your incision is monitored for redness and infection by your healthcare team while you are in the hospital. You will be encouraged to shower and get up to walk within 24 hours. You will also be prescribed pain medication. It is important that you feel comfortable asking for adjustments to the dosage if you are experiencing changes in pain. Pain management is important for healing and being able to comfortably care for your newborn. Once you are home, you may need someone to help you monitor your incision (from experience, it was difficult to see the incision myself). One last piece of advice from my own experience: place a pillow over the incision (on top of your clothing) because the area will be very tender, especially while holding your baby or adjusting your position. For episiotomies, wound care begins immediately. You will most likely be prescribed pain medication as well as a topical antibacterial cream for the incision itself. An ice pack will help with pain and inflammation. Sitting in a warm bath with Epson salt (“sitz bath”) 2-3 times per day will cleanse the wound and relieve some of the pain. Uterine massage is important to help deliver the placenta and to aid in uterine contractions. This ensures that the uterus expels all of the excess tissue and returns to its normal size. Most nurses will do this for you while you are in the hospital. I have to admit I was a little surprised to see this was a concern of mothers in the first few days postpartum! There is so much pressure in our society to conform to the ideal body image that we see in the media. Remember, it took you about 40 weeks to carry your baby to term, and most healthcare professionals say that it will take about 40 weeks or up to 1 year to get back to your pre-pregnancy weight. Pregnancy weight gain not only includes weight from your baby but from body fluids and tissues to support the growth of your baby as well. During the first few days postpartum, you should not push yourself too exercise too hard or too soon. Your body needs time to rest, relax, and heal. If you’re jealous of how svelte stars like Angelina Jolie and Reese Witherspoon manage to look red-carpet ready in just a few months after giving birth – consider this – if you had the money to hire a 24/7 personal trainer, nutritionist, chef, nanny, and buy an unlimited supply of Spanx, then you could look like them too! How soon you can begin to exercise after giving birth will largely depend on what kind of shape you were in prior to your pregnancy and your fitness during pregnancy. Most people will say that you can resume activity and exercise “when you feel up to it” but moms recovering from a c-section may be asked to wait until their 6-week check-up before restarting an exercise regimen. For all moms, easy walks up to 30 minutes in length can begin a few days postpartum and you can slowly increase exercise intensity as your body regains strength. Newborn babies will cry, wake, and need to be fed often! Healthy newborns (after they are cleaned up!) will have warm, pink skin and will try to interact with you. If your baby abruptly changes his behavior – i.e. suddenly begins to cry more often than usual and cannot be consoled or becomes lethargic, this may be a sign of illness or injury. Keep in mind that sometimes a baby’s “good” behavior can be misleading. Babies that sleep all of the time, do not wake to feed consistently, or never cry may not be feeding or growing well. Call your pediatrician immediately. If you swaddle your newborn, it is important to un-swaddle them to change diapers and to monitor their skin tone and color. If you are worried that your baby may be sick, call your doctor or advice nurse. Newborns have very tiny stomachs so they can only eat very small amounts at a time. So if it seems like your baby wants to eat “all the time” – You’re right, he needs to eat frequently! During the first 3 days, babies should be fed whenever they show hunger cues -which can be up to 12 times per day! (Do keep in mind that cues may be unreadable or conflicting in the early newborn period. For more information about newborn behavior in the first 72 hours, click here. Twelve feedings per day may seem like a lot, but remember that feeding takes practice, so the more you do it during those first few days, the better you and your baby will become at breastfeeding! For more information about breastfeeding after a cesarean section, click here. Note: Days 4 and 5 postpartum usually have the most feeds. Many mothers then think that they do not have enough breast milk. This is not true! This sudden increase in feeds helps prevent engorgement (from the rapid increase in milk supply around this time) and gives mom and baby lots of practice feeding, right when they need it most. We hope the answers to these questions provide information to those of you who are new or prenatal moms with similar concerns! Next time we’ll address mothers’ most common concerns in the weeks and months after giving birth. There are a lot of new things to consider when preparing for pregnancy, birth, and the postpartum period. Today, we will present an article that describes a review of 18 scientific papers and a list of the most important things that mothers want to learn after giving birth. We have also done a little research of our own to find the answers to these common questions, just in case you were wondering about some of the same things! However, you’ll have to stay tuned for the answers in the next few posts! For mothers who have had c-sections, the first 3 days are generally spent in the hospital with access to nurses, lactation consultants (in some cases) and doctors to answer their most pressing questions. Mothers delivering vaginally, however, may be discharged from the hospital 24 to 48 hours after an uncomplicated birth; it’s not surprising that mothers’ primary concerns centered around their babies’ feeding and care during their first 3 days of life. Mothers asked questions most often about learning how to recognize and treat infant illnesses and how often and how much to feed their infants. Interestingly, there were only minor differences between questions asked by first-time mothers and mothers who had had children before. For first-time moms, the most universal question on the 1st day postpartum was how to care for surgical wounds like c-section incisions and episiotomies. Other common postpartum care questions included combatting postpartum complications, illness, fatigue, and the purpose of uterine massage in the hospital. The concerns of mothers who have had a child before were only slightly different. The most common questions these moms had were the same as the first time mothers’ questions with the additional concern of appropriate maternal physical activity and how to return to their ‘normal’ figures (or weight). By this time, most mothers are back at their own homes, and after having tackled the art of diaper changing and feeding, have a new slew of questions about caring for their baby, themselves, and their new family as a whole. In this review, the most important issues to address during the transition from hospital to bringing baby home for both first-time and veteran moms were returning to their prenatal figure, postpartum exercise, “mothering” in general, and meeting the demands of everyone at home. Understanding Baby Behavior is a universal concern of parents all over the world. This study found that during their babies’ first few weeks, mothers were concerned about their babies’ behavior, fussiness, need for stimulation, growth and development, and feeding – all things we hope you have learned from our previous posts! (for a quick refresher on the basics of Baby Behavior, you can review the crying , sleep, states, and cues posts.) Other, less frequent questions were about support bras, perineal care, and how to deal with older siblings and sibling reactions when the new baby came home. We know from experience that being aware of common questions can be a relief, helping new parents know that they are not alone in their concerns! If you haven’t ever stopped to consider any of these questions, don’t worry! We will be providing the answers to these questions in the next couple of posts! Reference: Bowman KG. Postpartum Learning Needs. J Obstet Gynecol Neonatal Nurs. 2005 Jul-Aug;34(4):438-43..
We're "out and about" teaching again. We'll be back with new posts next week. Have a great weekend! Though far from an ideal situation, it is becoming more common for caregivers to have career or other obligations that keep them separated from their children for extended periods of time. Whether you are a grandparent living 3000 miles from your granddaughter, a member of the armed forces stationed overseas, or a parent who is required to take frequent business trips, you know the pain that comes from being absent during your child’s day-to-day growth and development. You may worry that you’ll miss some of your child’s most important milestones (like sitting up, walking, talking, or enjoying storybooks) even if you are away for only short periods of time. It is normal to want to be with your growing child and to feel upset by your absence. The good news is that there are ways that you can continue to stay connected to your child during these pivotal times despite being many miles away! When you can’t physically be with your child, the second best option is to be there virtually. Services like Skype, Google video chat, and Facebook offer options to video chat from a distance. Video chats allow you to see your baby and for your baby to see and hear you in real time, allowing for “face-to-face” interaction. While adding video may not seem very different from a phone conversation, babies are drawn to visually stimulating images. That means that being able to see his dad or grandma’s face is far more engaging for a baby who can't understand where the voice on the phone is coming from. Toddlers and preschoolers may be more interested in the phone, but they can be difficult to understand. When you can read your child's facial expressions and pick up on subtle cues you see through video, the conversation can be more rewarding for you as well as your child. If you don’t have access to video, talking to your child on the phone is still a worthwhile option. Just be prepared that you may not have much of a conversation until the child is much older. You might want to try using the phone to sing to your baby or tell a story. Make sure that your child has a picture of you nearby so that your child can make a connection between the voice on the phone and your face. Sending notes and small gifts can be fun for you and your child. Cards and care packages are exciting for older children and having a photo album or special trinket that your child can hold will remind him of special moments with his long-distance parent or other family member. Knowing that reading to your child has profound benefits for your child, consider using a video chat service to read to your child. You might need 2 copies of the same book so that you can see the pages as your child sees them. Many classic children’s books can be obtained in paperback for very little money. For those of you who want something a little fancier, we found an organization that offers a way for you to record a video of yourself as you read. A Story Before Bed allows you to purchase a book from their online library and then record yourself reading that book (through the web camera on your computer or mobile device). According to their website, the company is in about half-way through a campaign to donate 250,000 free bedtime stories to military families who have a loved one stationed overseas. There may be other companies that do the same thing. Traveling is an abstract idea for young children. You can help make the concept more concrete for them by pinpointing your location on a map (on paper or online). If your trip includes multiple destinations, you can use a globe or a large map tacked to the wall to help your child trace the route you are taking directly onto the map. You also might have your child “count down the days” until you return by crossing the days off a calendar or removing items from a bowl containing the same number of objects as the number of days you will be gone. For example, the bowl would have 7 rocks or bean bags if you were going to be gone for a week. These are just a few ideas to help make necessary separations easier. 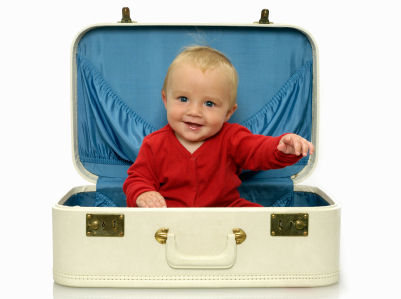 We’re sure that many of you have discovered other great ways to foster a long-distance relationship with your child. If you have any ideas you would like to share, we would love to hear from you! 1. 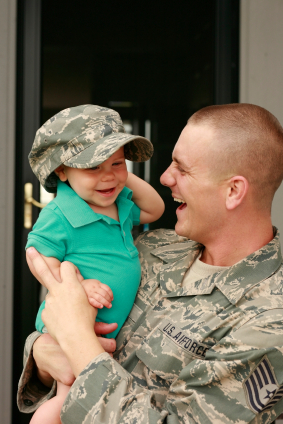 Schachman, K. Online Fathering: The Experience of First-Time Fatherhood in Combat-Deployed Troops. Nursing Research. 2010. 59:1; 11-17. 2. Faure, M., Richardson, A. Baby Sense. New York, NY: Citadel Press, 2006. We know that we have some long time readers whose babies are well into their 2nd year as well as newer readers with newborns and others who are still waiting for their babies. Every few weeks, we thought we'd ask our "old timers" to share some of their babies' firsts with our "newbies." To start us off, here are our questions; you can respond by posting a comment. 1. How old was your baby when he or she smiled at you or someone else for the very first time? What do you remember about why your was baby smiling? 2. How old was your baby when he or she first laughed for the very first time? What was your baby laughing about that very first time? Anyone who’s explored this site should have a good idea of how babies sleep, cry, and communicate. Even though we have provided a lot of information about how and why babies behave the way they do, we know that all babies are different and that parents know their babies best. For example, we’ve explained how babies can get overwhelmed easily and that a change in routine can have an impact on their behavior, but only you know whether a long day at a birthday party will end in an extra hour or two of sleep or a night full of tears and frustration. When a baby is sick, however, everything you know may be flipped upside down. A baby who has started sleeping through the night may suddenly start waking up several times or a baby who loves the car may scream all the way home. When a baby is sick, the discomfort can take over and cause her behavior to become unpredictable. In this post, we’ll describe the symptoms of some of the most common illnesses and how these symptoms may affect a baby’s behavior. As you are reading, keep in mind that all babies are different and that this post is not meant to diagnose any infant illnesses. If you are concerned that your baby may be ill, discuss the symptoms with your pediatrician right away. Colds are caused by viruses and are highly contagious; meaning your baby (whose immune system is still developing) will probably get several colds before his first birthday. Studies indicate that many infants get 6 to 10 colds in the first 2 years of life. Colds can be particularly hard for babies because they can’t do many of the things adults do to cope with the symptoms, like blowing their noses or taking medication to relieve discomfort. When a baby has a cold, the nasal discharge will be slightly colored (sometimes brightly colored) and thick. You may be able to tell if his throat is sore if his cries sound hoarse and if he has trouble swallowing. The combination of stuffy/runny nose and sore throat can make eating unpleasant, so some babies have a decreased appetite when they have a cold. Even though there is no cure for the common cold, there are things you can do to make your baby more comfortable, like using a bulb syringe to relieve nasal congestion and keeping a humidifier in the room where the baby sleeps. Remember, you should NEVER give your baby medication without first consulting the doctor. Ear infections can be caused by a virus or bacteria, and may or may not coincide with cold or flu-like symptoms. Infants and children tend to get more ear infections than adults because their ear canals are much smaller, so fluid can’t drain out as easily. 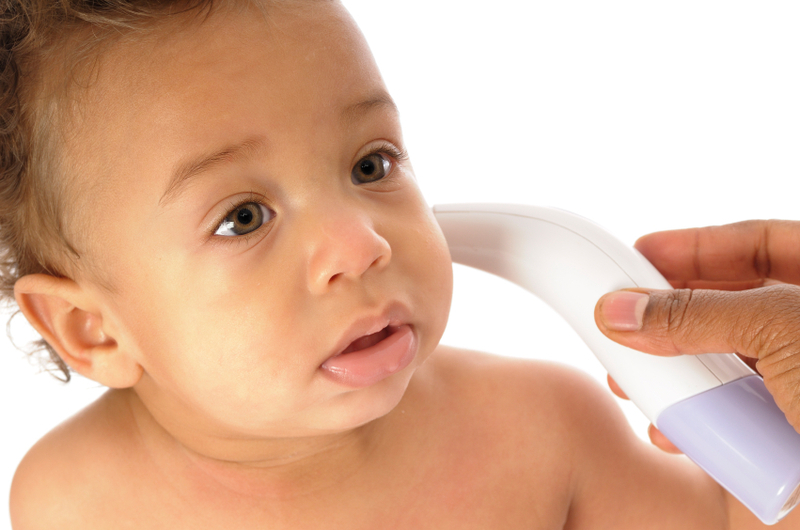 The symptoms of an ear infection vary greatly from baby to baby and even from infection to infection in the same baby. Because the infection usually causes pressure and/or pain in the ear, parents commonly report that their infants become fussy when lying down. Although tugging at the ear can be a sign of an ear infection, many babies bring their hands up to their ears to help soothe themselves or just to play and others never seem to tug on their ears, even when they are infected, so it can be a misleading symptom. My oldest daughter has had several ear infections, but I have never noticed her tugging on her ears and my youngest daughter has never had an ear infection, but I see her pulling on her ears every day. The flu is caused by a virus that spreads through the air when an infected person coughs, sneezes, or talks. It usually occurs during the winter, but outbreaks can occur any time of year. The flu is much more dangerous for infants than it is for adults. When a baby has the flu, she may be so tired that she sleeps through feedings or so achy that she has trouble going to sleep at all. Vomiting and diarrhea don’t always occur, but when they do, the baby is at risk for dehydration. If you suspect your baby has the flu, you should call your doctor immediately. To prevent spread of the flu, vaccines are available for babies who are at least 6 months-of-age, children, and adults. More information about prevention, symptoms, and treatment of the flu is available at http://www.flu.gov/. Unfortunately, there is no way to predict how your baby will react to any illness. In addition to the discomfort your baby is feeling, she will also be coping with a disruption in her routine. Even though caring for your sick baby can be challenging and stressful, once she feels better she should go back to her usual self. With 1/4 of babies in the US never breastfed and 1/2 breastfed for less than 4 months, delaying solid food introduction until after 4 months-of-age may be an important step towards decreasing obesity in young children. (2) Other studies also indicate that introduction of solid foods before 4 months of age is associated with rapid weight gain in infancy and higher body fat or weight in childhood. (3,4) Also, breastfeeding, even partly, for at least 4 months may be protective against early childhood obesity. (2) This is not to say that babies don’t reap added benefits when exclusively breastfed (such as reduced risk of gastrointestinal and respiratory illness, Sudden Infant Death Syndrome (SIDS) and allergies, to name a few)! (5) However, this particular study only compared breastfed (at least partly breastfed for at least 4 months) to formula-fed (breastfed less than 4 months or fed only formula) infants. 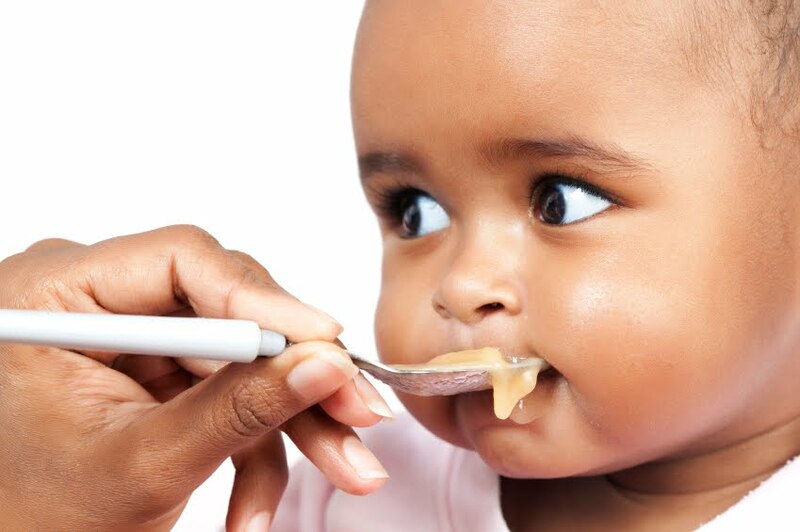 It’s also important to note that while it is recommended to delay solids until close to 6months-of-age, developmental signs of readiness for solid foods must still be observed in the infant before solid foods are introduced. For more information about what developmental signs to look for and which foods to feed first, click here. 1. CDC Breastfeeding Report Card –– United States, 2010. Web. 28 Mar. 2011. 2. Huh SY, Rifas-Shiman SL, Taveras EM, Oken E, Gillman MW. Timing of Solid Food Introduction and Risk of Obesity in Preschool-Aged Children. Pediatrics. 2011 Mar;127 (3):e544-51. 3. Baker JL, Michaelsen KF, Rasmussen KM, Sørensen TI. Maternal prepregnant body mass index, duration of breastfeeding, and timing of complementary food introduction are associated with infant weight gain. Am J Clin Nutr. 2004;80(6):1579-88. 4. Kim J, Peterson KE. Association of infant child care with infant feeding practices and weight gain among US infants. Arch Pediatr Adolesc Med. 2008;162(7):627-33. 5. Kramer MS, Kakuma R. The Optimal Duration of Exclusive Breastfeeding: A Systematic Review. WHO, 2002.